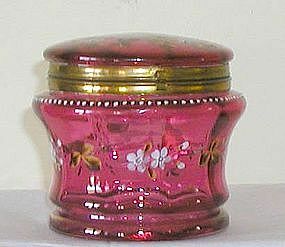 Lovely old craberry hinged box with a raised white enameled oval in center painted with flowers. easures 4 1/2" tall x 5" diameter. Condition is perfect. 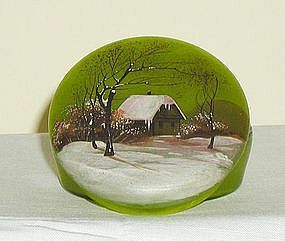 This is a lovely vintage Lenox powder box signed with the green Lenox mark. 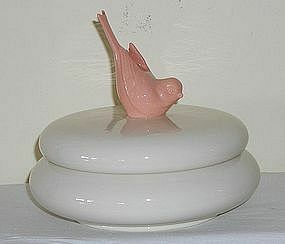 There is a pink bird that sits atop the lid. It measures 7" wide x 6 1/4" high and is in perfect condition. 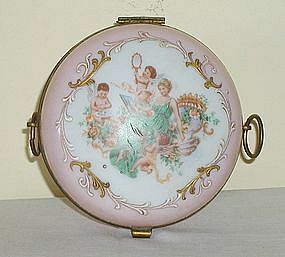 Lovely footed round box, the hinged top picturing cherubs around a woman. 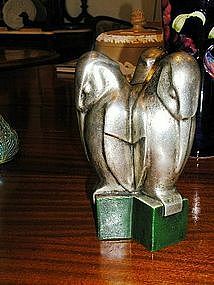 It measures 5" tall and 5 1/2" wide and is in perfect condition. 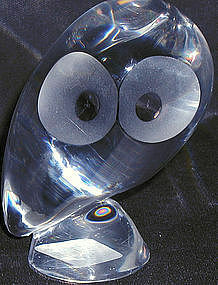 This is an absolutely beautiful piece of glass, and the decoration is so elegant. I believe it started life as a vase and was made into a lamp at a later date. The background glass is sort of mottled, but almost in stripes, in gray, gold and white. It is decorated on both sides with lotus blossoms. The paint on the blossoms is so thick that it is three-dimensional. 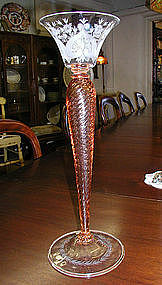 The beautiful piece of glass measures 16" tall as a vase, and 32" tall with the attached harp. It is in perfect condition. 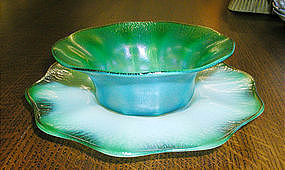 Beautiful vivid green finger bowl and underplate, both signed Tiffany Favrile. They both have white highlights, but the plate shows up more than the bowl. 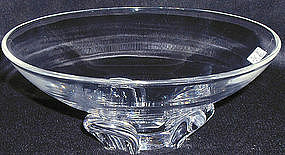 The bowl measures 5" in diameter by 1 3/4" tall; the plate measures 6 3/4" in diameter. Both pieces are in perfect condition. 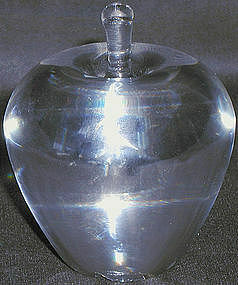 Exquisite and very unusual Moser vase. 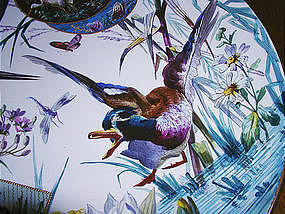 Patter is like a paper doily, but its all enamel, raised and with white enamel jewels. 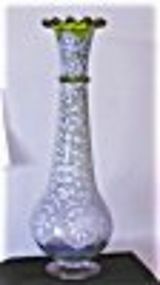 This lovely vase measures 20 1/4" tall x 6 1/2" wide. It goes from light green at the base to a darker green on top, and is in perfect condition. Beautiful, very large hand enameled vase by either Moser or Mont Joye. I'm not sure which, as I have seen vases like this attributed to both makers. 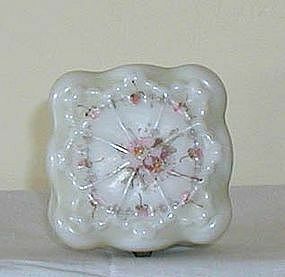 This one is quite large - 15 3/4" tall x 6" wide at its widest. 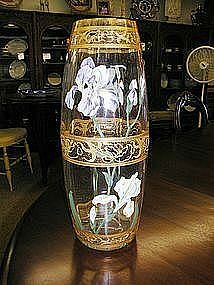 It is beautifully enameled with purple and white iris on one side, and all white iris on the other. 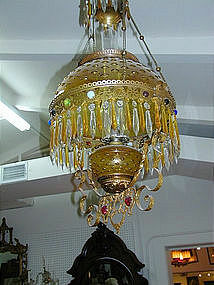 The glass itself is lightly ribbed vertically, and there is gold iris decoration bordering the top, center and bottom. It is in perfect condition. Beautiful engraved candlestick, signed with the fleur de lis. Measuring just under 15" tall x 5 1/4" diameter at the base and 4 1/2" diameter at the top. This is one of the prettier of Tiffany's pastel pieces. 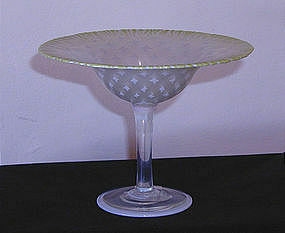 This compote, measuring 5 1/8" tall x 6 3/4" diameter at top, is made in a bright, vibrant yellow at the edge of the top. The rest of the dish part is clear, with opalescent white stars. It is just beautiful. Signed on bottom, this piece is in perfect condition and definitely a collector's item.